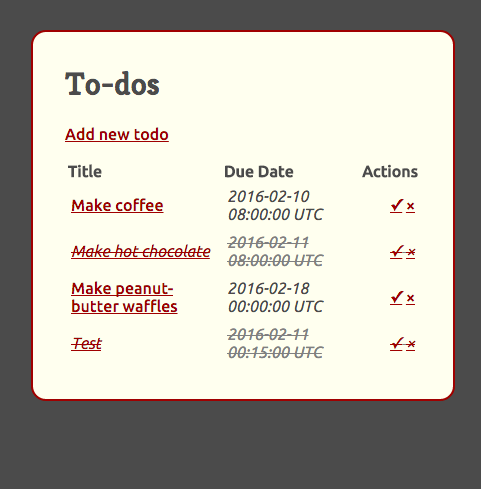 Today, I start adding due dates to the to-do items. I’m still enjoyably surprised by how easy it is to add more fields and the corresponding logic to a Ruby on Rails app. However…I didn’t realize at first that the migration name should have the format AddXXXToYYY, and so was puzzled why the migration file didn’t have my new column in it. I copied and pasted the add_column declaration from a previous migration, changed what I needed to, and it worked. When editing items, they seemed to be toggling back and forth between completed and not completed. First, I tried to fix the issue of the duedate not being saved. I added render plain: params[:todo].inspect into the def complete controller block, but it didn’t do anything. Eventually I realized that I’d forgotten to add it as a permitted parameter; that fixed that issue. Somewhere along the way, though, I realized that the complete controller was handling all the updates, so commented it out and immediately ran into more errors. Turns out the new patch 'todos/:id', to: 'todos#complete' route was handling all the updates, and it was testing whether the completed was set to true or false and toggling it, because that’s the behavior I needed for the one-click completion. After a bit of research, I figured out that for the one-click completion, I needed a named route; this did the trick: get 'todos/:id/complete' =&gt; 'todos#complete', as: :completed. In the controller logic, rather than just toggling the “completed” attribute, check to see what the route is and then complete/uncomplete based on that. At this point, I figured I may as well add some basic styling. While doing that, I decided to show the completed items in the main list as well as the remaining uncompleted items. That took just one lines of logic to add a completed or uncompleted class to the row, as well as another determining which path to use for the action links. Next up: sorting the list to move the completed items to the bottom, as well as sorting the remaining items by date.